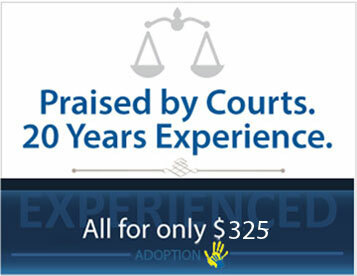 Professionally prepared adoption for only $395. Adoption forms specific to your Province. Adoption department will prepare your forms ready to sign and file with the court. The judge said it was the largest adoption he had ever done and the paperwork was perfect. The judge said it was the best pro se adoption paperwork he'd ever seen. The Judge was impressed with the quality of the documents we presented. The Judge was very impressed with all of the paperwork. The judge was so impressed with our paperwork and asked us who the attorney in the family was. The Judge and all the court house employee’s were so impressed. The Judge said the paperwork was so well done and he knows a few attorneys that could take notes. HELPING FAMILIES COMPLETE THEIR ADOPTIONS. We have helped thousands of families complete their stepparent and adult adoptions. We help families complete their adoptions without having to pay thousands to an adoption lawyer. 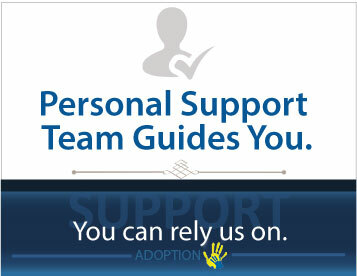 Our experienced team prepares your adoption documents specific to your individual situation. With our program, you get the documents and the assistance to be able to complete your own stepparent or adult adoption. Stepparent adoptions can be fairly simple and straight-forward, as long as you have the proper legal documents and the assistance needed to properly process the adoption through the courts in your Province or Territory. We have helped families for over 20 years successfully complete their own adoptions. We know that many families don't have the financial means to pay several thousand to an adoption attorney. We help those families complete the adoption, and do it within their budget. If you are looking to adopt your stepchild, we can help you get the adoption completed. Adult adoptions are the simplest type of adoption because as an adult, the person being adopted can decide on their own that they want to be adopted. An adult adoption is usually much quicker with the courts. Typically taking 1-2 months to be finalized. If you are an adult and want to be adopted, or you want to adopt another person who is an adult, we can help you get the adult adoption completed. Most adoptions do not require any final hearing. The finalized adoption is sent back to you in the mail. Highest quality stepparent adoption forms available. We are the industry leader in helping families complete their own stepparent adoption. Our affordable program is court approved and comes with a full 100% court-acceptance guarantee. If you are looking to unite your family and adopt your step child, our years of experience is the key to ensuring that you will have a trouble-free adoption. We have helped thousands of families complete their stepparent adoptions and we want to help you today. Let us help you unite your family through adoption! We love what our customers say after using our service. Times have changed. There was a time when getting a divorce meant spending thousands of dollars on a divorce attorney. It was usually a drawn-out, expensive process. Now that has changed. You can get attorney quality divorce forms and the support you need to complete your own divorce. Question: Will I really be able to complete my own stepparent adoption or adult adoption. I don't want to waste my time and money. Answer: Yes, you can. We have helped thousands of families successfully complete their adoption. You can too. Question: Does the other parent need to sign a consent?. Answer: A consent from the other parent is not required in an adult adoption. In an adoption of a minor child, most of the families doing an adoption cannot get the other parent's consent, and the adoption is done without consent on the grounds of abandonment. Question: How long does the process take. Answer: Your adoption documents are prepared and sent to you in about 24 hours. Then we will get back together to go over the documents so they can be signed and filed with the court. The adoption process with the court typically takes about 3 months. An adoption specialist will prepare your adult or stepparent adoption forms and send them through a final review process to be sent out. 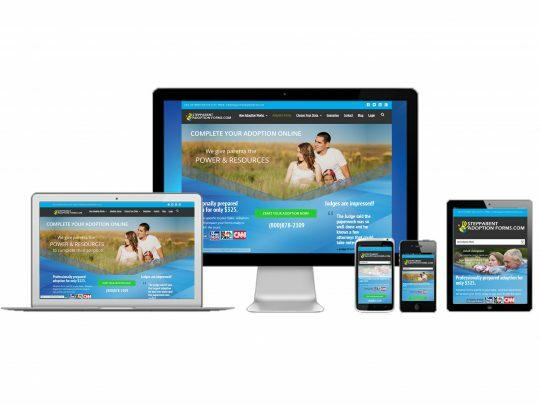 No automated systems - Just true professionals. Great News! Our adoption was granted last week. Thank you from our entire family for your tremendous support throughout this process and helping to make our dreams come true. Good afternoon, I just wanted to write to tell you how pleased I was with your service. You sent the forms quickly to me after submitting payment, and each time I called there was a friendly person on the line who could answer all of my questions. We filed the paperwork on July 5th and the adoption was finalized on July 21st! The clerk was a bit skeptical that we weren't using an attorney, but the judge said it was the best pro se adoption paperwork he had ever seen - he said normally without attorneys he has to send people back no less than 4 times to get the paperwork he needs. Two attorneys quoted me $5000 to handle this. The request to waive the home study was successful- this also saved us quite a bit of money, and was never even mentioned by attorneys as an option. Thank you thank you for everything! Superb company and service! My experience with your company had been a pleasant one. They have worked with me, and have went as far as making changes for my forms 8 months later. They are a very pleasant group of people and very professional! So glad I choose them!! Thank you so much for all your help and support during our stepparent adoption process!!! We were finally able to complete the journey this passed Thursday (April, 2014)!! In fact, the Judge even said that the paperwork was so well done and thorough that he knows a few attorneys that need to take notes!!! Thanks again!!!! You all are amazing. I will recommended you to any one who is seeking to help the future of their children. Thank you so much. I would just like to say thank you, our adoption was finalized yesterday with no issues. This entire process has been easy and we couldn't have done it without your help. The price was within our budget when using a lawyer would never be. Even the judge commented on how thorough our paperwork was! THANK YOU! We went today for our hearing, my husband is adopting my child. The judge was so impressed with our paperwork and how we had every single paper we needed, he even asked us who the attorney in the family was. He was shocked when I told him it was from an online site, commended us on a job well done and finalized the adoption. TODAY in just one hearing. We want to thank you for a job well done, because of your company we had a quick, easy and painless step parent adoption done in just a couple short months! Thank you so much!!!!!!! Hello again: I just want to say that your organization is making a completely overwhelming process so much easier. I even spoke to someone on the phone today that was so helpful I was tempted to call her back and thank her. I'm sure I will have more questions as this process goes on, but the timeliness and support I have gotten so far has helped me to see past all the chaos of the paperwork and reminded me why I'm doing this because I love the child I want to adopt as if she were already my own. Thank you for your compassion and expertise. May you have a wonderful holiday. Hello, I would love to write you a testimonial! We filed the papers on June 14th and by August 1st we were granted a full and complete step parent adoption. Everything went beautifully thanks to your company and help and I greatly appreciate it and would recommend your company to anyone! Thank you again. Just wanted to let you know that I was completely successful in adopting my Son. Before getting the forms from you an attorney quoted me $1500.00 to do the adoption! When I filed the court clerk seemed very surprised that I was doing it myself without a lawyer, but the process went smooth and without any major hitches. Even when I needed an additional background form, I emailed you and you sent it to me without delay. Thank You. Great customer service. Saw the Judge this morning. She signed the documents. Everything went fine, and am glad this is all behind us now. Couldn't have done this without your help. Your continued support throughout the process is the only way I could have completed this adoption. You render a valuable service over there. Thanks. I went to my hearing yesterday and my adoption is final. Your service was always expedient, and helpful. 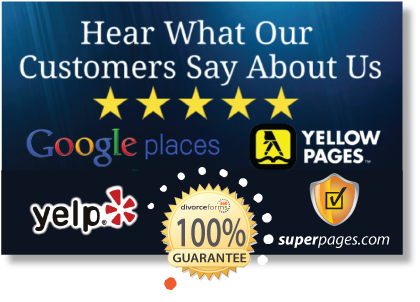 You have a very professional company, and when having different options, I am so glad I chose your company. My adoption went through on April 14, 2011, thanks to your company. It was a rough road for me because my state has a lot of hoops to jump though. You guys were there for me helping me through out the ENTIRE thing! I am so happy to have found this company and can't say enough good things about it. I started the adoption process in January 2011 and it is now complete! The Judge and all the court house employee's were so impressed that I was able to do everything with out a lawyer! You all have been such a blessing!! These people are no joke! What they say, they will do! Great company!! Thank you so much from my family and my self! WOW that was fast! THANK YOU! BTW my husband adopted my daughter on 8/23/08. The process was smooth and flawless thanks to your detailed adoption packet and instructions. THANK YOU for making our family complete. Wishing you the best. Just a quick note to say thanks for all your help. I was scared at the beginning, but your customer service department was great and made the process so easy for me. I will recommend you to anyone who needs this service.